FlapJacked, Mighty Muffin with Probiotics 1.94 oz. Lenny & Larry's, Protein Cookie 2 oz. Mamma Chia Squeeze Vitality Snack, 3.5 oz. The GFB Gluten Free, Non-GMO High Protein Bars, 2.05 oz. Rip Van Waffles Snack Wafels, Variety Flavor 1.2 oz. Bite Fuel, Protein Granola Trail Mix 1.5 oz. Health Warrior Chia Bars, Variety Flavor.88 oz. Nature's Bandits Organic Fruit & Veggie Stix. 1 oz. Beanfields Bean and Rice Gluten Free Chips 1.5 oz. Pirate's Booty Aged White Cheddar.5 oz. Wonderful Pistachios, Roasted and Salted 1 oz. Natures Bakery Fig Bar, Variety Flavor 2 oz. Skinny Dipped Chocolate Covered Almonds .46 oz. This box is the perfect mix of sweet, fruity, savory, delicious, and most importantly healthy Candy, Cookies, and colors that light up the room. Our signature combination of Sweet Decadent Waffle Cookies, Soft and Chewy Cookies, Fruit Bars, Chia & Nut & Fig Nutrition bars, and Decadently Covered Chocolate Almonds that will make your sweet tooth go wild. To even out the palate, savory BeanField bean & rice protein chips. To top it off, we added a FlapJacked High Protein Muffin to ensure this gift is nothing but exceptional. THIS GIFT IS PERFECT TO LEAVE ON ANY COUNTER TOP. There is something delicious in this Box for everyone in the family; even the pickiest of eaters will enjoy this nutrition filled Gift Box.This box will literally light up the room and look amazing next to flowers or an afternoon brunch!! * *On rare occasions, due to supply constraints, we may use replacement items- always healthy and of equal or greater value. 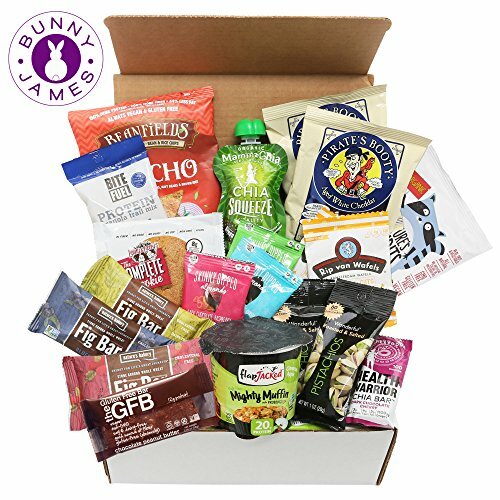 NON-GMO VERIFIED, LOW SUGAR SNACKS- GUARANTEED FRESH: The Bunny James gift box is filled with 20 premium individually wrapped single serve snacks. This healthy snack box includes a mix of festive sweet treats and delicious snack options that everyone will love. CUSTOMIZED POEM INCLUDED! Ideal birthday gift basket for loved ones, perfect to indulge sweet tooth cravings, guilt free. GREAT HEALTH CARE PACKAGE GIFT BOX: This healthy variety package is the perfect birthday gift for any health-conscious father, grandfather, mother or grandmother. It is also great for kids, families, colleagues, clients, military, get well soon care packages. Great for your girlfriend, wife, or child. ARTFULLY DECORATED: Each box is hand crafted and packed with care. Ornamented with grass, the Box will arrive looking like a miniature garden along with life enriching nutrition snacks. SHIPS FAST! Click 'Add to Cart' to treat the lucky recipient to this memorable gift! Select "gift" at checkout to include message. If you have any questions about this product by BUNNY · JAMES ·, contact us by completing and submitting the form below. If you are looking for a specif part number, please include it with your message.